I can think of no better game to review now when we have a fear of nuclear annihilation thanks to two overgrown children in power. It's none other than DOOM for Nintendo Switch! It took less than year, but already the Nintendo Switch is DOOMed. 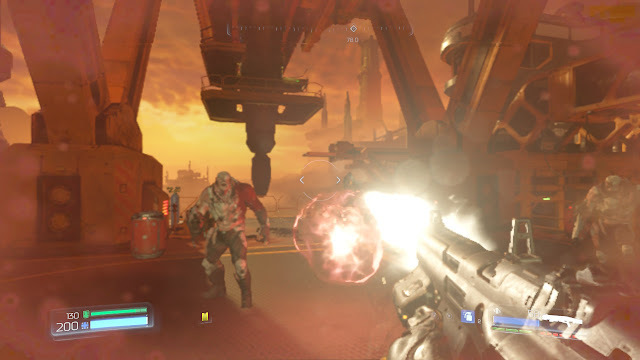 In 2016, Bethesda and Id Software came out with one of my favorite games from that year, the revitalization of a series through a game simply titled DOOM. It brought the series back to what it made it so successful back in the early '90s. 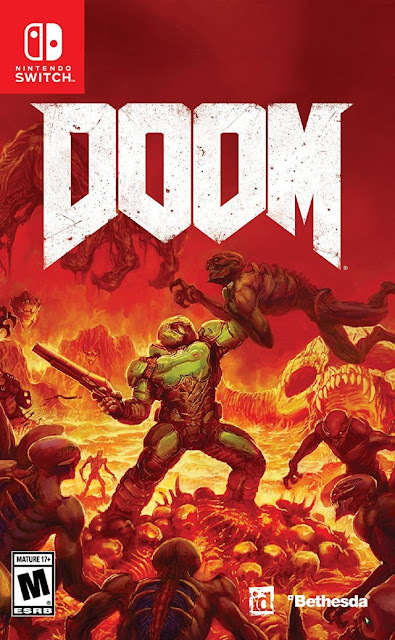 With a new coat of paint, astonishingly creative design, gore-filled, action-packed goodness, and a rocking Mick Gordon soundtrack, DOOM 2016 amazed and bewildered with its insane quality. One of the things that was so prominent about DOOM's 2016 release was just how visually impressive it was. It's the type of game that Nintendo Switch owners could only dream of having. With much befuddlement, Bethesda and Nintendo announced last year that DOOM would indeed be coming to the Switch. How?! What massive compromises would have to be made?! Would someone pinch me, because I think I'm dreaming?! But, screens came out, then videos came out, then impressions came out, and apparently, DOOM on Switch wasn't just a reality, but it was supposedly running well. After playing through DOOM's 2016 release on PlayStation 4 and now in 2017 and 2018 on Nintendo Switch, is DOOM on Switch a worthy port for Nintendo fans? There are no friendly faces to be found in Hell, so just shoot at anything that moves! 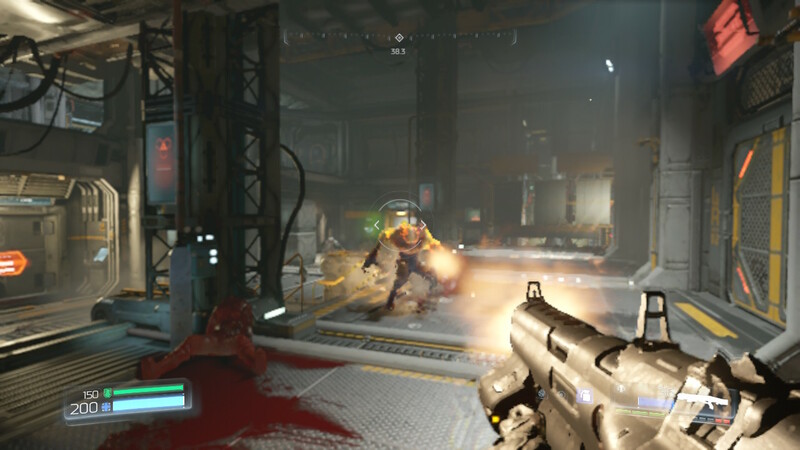 DOOM forgoes the linear corridor shooter aspect of AAA gaming that has permeated all throughout FPS games over the course of this past decade and some change. Levels in DOOM are labyrinthine-like maps of sprawling chambers, rooms, hallways, and vistas, sprinkled with areas to explore, secrets to discover, enemies to wipe out, and blood to be shed. The amount of optional content in each level can get a bit staggering: from the well-hidden, secret alcoves containing little DOOM-Guy dolls, to dead UAC soldiers holding onto ID cards that can be used to upgrade the player, to playing battle scenarios in the Rune Trials to earn a much coveted Rune, to Argent Cells that can found and utilized to power up either the player's health, armor, or ammo capacity. Then, there are the three challenges in each level. In the earliest levels, these start out as simple tasks, such as killing two enemies at the same time, but they can get more complex and complicated as DOOM progresses, sometimes requiring the player to kill several Imp enemies each with a different Glory Kill. This place is going to be in serious need of a good interior decorator after we're done here. Speaking of the devil, or at least Glory Kills, these powerful, instant-death maneuvers allow you to wipe out a flashing enemy with a melee attack for a satisfying kill. After peppering an enemy with enough bullets and damage, the enemy will start flashing white. Get close enough to it, and it'll flash orange, meaning you're close enough to deliver a final blow with your melee button. Not only do Glory Kills feel great to perform, but fallen enemies that succumb to them drop much needed health. After all, DOOM is old school in how it handles health. No regenerating health in this game, ladies and gentlemen. My, what big... everything you have! The better to get blasted by rockets with! Now, let's get to the part of the review that most who have already played DOOM back in 2016 on other systems are interested in: How does the game play ported to the Nintendo Switch? Well, overall, DOOM on the Switch runs well considering the hardware. It looks best in docked TV mode, but it's also impressive in undocked/handheld play as well, though not as much, of course. In docked mode, the visuals are sharp and exude plenty of details while undocked sort of appears to have a Vaseline smear filter over it, especially when things like motion blur are turned off. There are some noteworthy issues with DOOM on Switch specifically in the technological and especially the audio department, however. 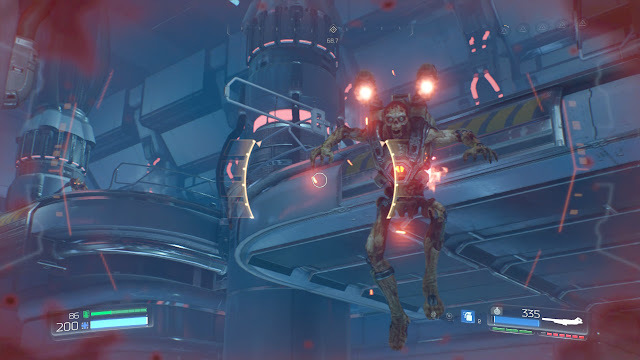 For one, DOOM isn't exactly lacking bugs. I've had times where I've had to restart portions of levels because one enemy found itself hiding beyond my reach, outside the level's geometry, meaning I couldn't kill every enemy in the room, thus keeping the doors locked shut. Other times I fell through the floor to face my doom in the great beyond below levels. An annoying audio glitch occasionally popped (and I do mean that literally) up, where the audio would pop really loudly and then get followed up by a bunch of silence. Sometimes this would correct itself while other times I'd have to restart from my last level checkpoint. These are small, niggling issues, but they add up to a less than stellar experience for the campaign overall. I'm really interested in seeing if the maker of the Nintendo Switch port, Panic Button, and publisher Bethesda will work together to remedy these bugs. These particular enemies take to the air and pummel you with missiles. Control-wise, there are a multitude of offerings to get a button layout that works best for any type of player, but at the same token, the analog sticks of the Nintendo Switch Joy-Cons don't particularly feel built for this type of game. Many times I found myself struggling to center onto an enemy target by just using the right analog stick for slight movements. Instead, I ended up having to strafe a lot to center my aim, which was not something that was a requirement on the PlayStation 4 version I played back when the game launched. Movement also is a little challenging at first, and that comes simply from having to get used to the range of the Joy-Con analog sticks. It's nothing that ruins the Switch version of DOOM, but it is something to consider. Thankfully, when it comes to multiplayer, everyone is on the same handicap. It's certainly not strawberry jelly accumulating on the edge of the screen here. Better take cover. 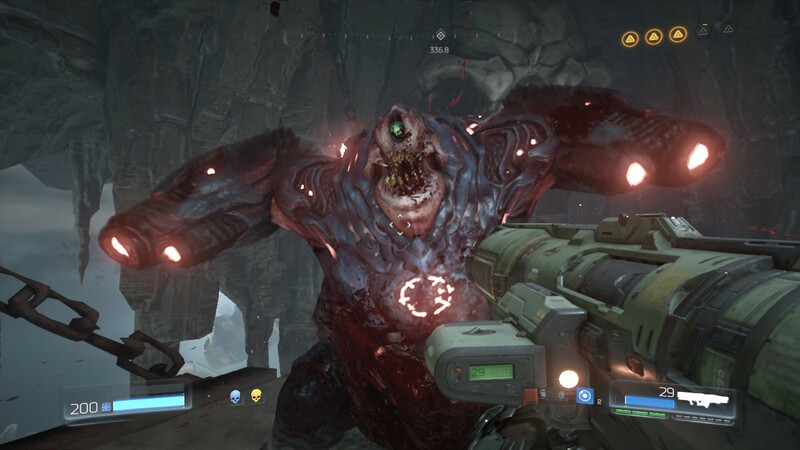 Speaking of, DOOM 2016 received plenty of regular updates on competitor systems and on PC as well. At first, DOOM multiplayer was very basic, and not worth investing too much time in due to how little there was to enjoy, and how limited the community was online. 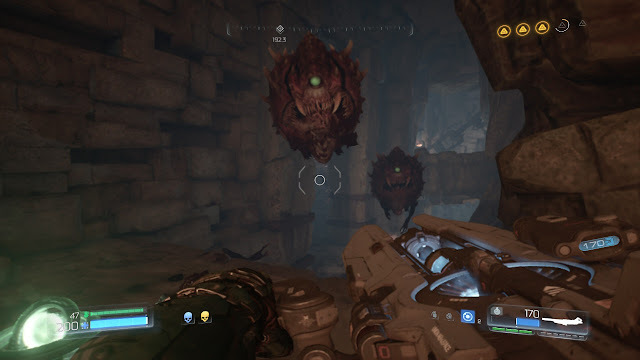 With update 6.66 (har, har) already included in the Nintendo Switch version of DOOM's multiplayer, everything has been improved for a superior experience right from the get-go. All of the addition modes from past DLC on the previous versions of the game, all 16 maps, all weapons, and a new challenge system that unlocks costume pieces and other rewards as you complete in-match goals like killing 10 players with your Heavy Assault Rifle or getting 10 Revenge medals, make for massive improvements to the multiplayer experience. The challenges are without question the most addicting piece of DOOM's multiplayer. These give you a wide assortment of tasks to accomplish within matches that you can gun and shoot for (literally). 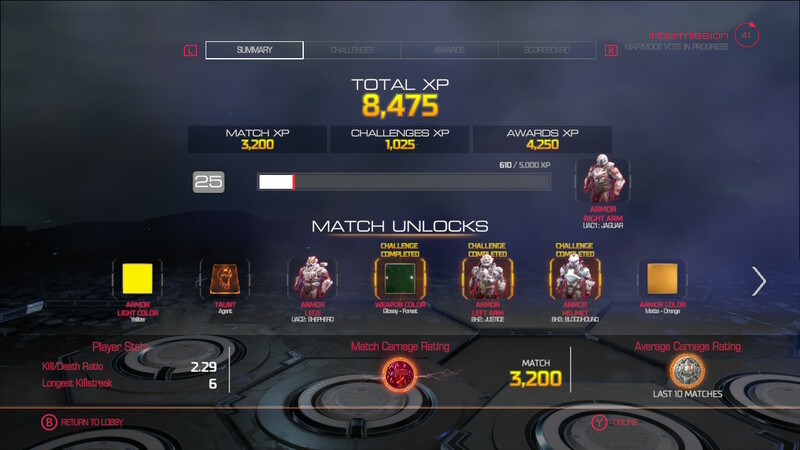 Each challenge completed (and they don't take too long to accomplish as long as you're aiming for them specifically) unlocks a new piece of content in the multiplayer for your custom character. Whether they are armor pieces, new colors and skins for said armor pieces, colors and patterns for guns, and experience, the constant winning of new goods through satisfying challenge conditions means that there's always something to shoot for in multiplayer matches, even if you find yourself on the losing end of each and every match. Hell must have frozen over -- Your buddy Phil did well in a DOOM multiplayer match. DOOM's multiplayer isn't just notable because it's really the only choice Switch owners have for a competitive multiplayer FPS experience, but it's also so because it's a damn good competitive multiplayer FPS experience in general. Whether practicing without a boost to your stats and challenges in Practice Mode playing offline against bots, or taking the bloodshed online against up to 9 other players in Deathmatch, Team Deathmatch, and a variety of other modes, DOOM's multiplayer has greatly upgraded its experience since the original 2016 game's launch. It says something when someone who doesn't play much online multiplayer gets completely engrossed in DOOM's multiplayer since the 6.66 update like this particular reviewer has, and I don't think I'm going to be stopping anytime soon! The Nintendo Switch's port of DOOM is a commendably done one by all parties involved. Bethesda for deciding to port the game to the Nintendo Switch, Id Software for collaborating with Panic Button to do the actual porting, and Nintendo for securing the game on Switch and building a hybrid platform strong enough (and surprisingly so) to allow DOOM to even be ported to the Switch in the first place. While technical problems in both visual and audio performance do seep through on occasion, DOOM on Nintendo Switch is a game you can play like Hell and rip and tear anywhere. Live from Central City, USA, it's Late Night with David VGMan! Tonight: Dave welcomes X and Zero from Marvel vs. Capcom: Infinite, Link starring in The Legend of Zelda: A Link Between Worlds, dragon lady Lilac from Freedom Planet, the limbless wonder Rayman in Rayman 2: The Great Escape, and last but not least, one of the most recognizable characters in pop culture today, Spider-Man! Musical guest: Counting Crows. Also, Paul Shaffer and the World's Most Dangerous Band! And now... after you've perused SuperPhillip Central's Favorite VGMs' VGM Database for all past video game songs featured on this weekly recurring series, let's get on to the music! While a constricted budget and a limited roster took a lot of the pizzazz out of Marvel vs. Capcom: Infinite, the fighting system stood strongly and more than held up its end of the game. I can't really say the same about the soundtrack, other than a couple notable remixes, such as this one from Mega Man X5. It's played in the source material in one of the final stages of the game where, as the title would suggest, X faces off against Zero. Within the game, it serves as a theme for both Mega Man X and Zero, the first of which finally got on a Marvel vs. Capcom roster after all this time! I won't spoil the actual final boss battle myself, but if you're at all familiar with the two main melodies heard during the theme that plays during the fight, one of them will give away who you're facing. It's a climactic final battle against the scourge of both Hyrule and Lorule, and only Link can raise his sword and vanquish evil once more. The reprise of Zelda's Theme in this song, played through once with angelic synth and then blasted out by bold, brass instruments, makes for an uplifting and motivating part of the piece. A wonderful addition to a glorious Nintendo 3DS soundtrack. Before there was Sonic Mania, a different game by a team of Sonic fans worked together to create a fan game. That turned into a wholly original project known as Freedom Planet. Though the levels occasionally overstay their welcome, everything from the fast and flowing gameplay, to the presentation nail the overall feel and aesthetic of the 2D Sonic games of Sega Genesis past. Freedom Planet is just a rewarding game in general, worthy of a purchase even if you don't have a nostalgic or grand affinity for the Sonic the Hedgehog games of yore. From one 2D platformer to a 3D platformer in a series that started off as a 2D platformer (I make things confusing, don't I? ), it's Rayman 2: The Great Escape, the often ported game that some say rival the 3D platforming genre's best. I'm not of that opinion myself, but Rayman 2 has a lot going for it, with its humor, wacky characters, superb level designs, tight controls, and smooth gameplay. The music is also a worthwhile aspect to note, with many of its tunes being great for listening to either inside or outside of the game. Our final guest this late night edition of SuperPhillip Central's Favorite VGMs is none other than your friendly neighborhood Spider-Man. Specifically, it's his 2002 video game based off of the movie of the same name. It follows the story of the movie while also adding in some other thrills like villains such as the Shocker and Vulture to beef up to playtime and enjoyment of the game. The orchestrated soundtrack is mesmerizing, particularly this first track, heard as Spidey starts off with but a ski mask and a hoodie in the first mission of the game. A Hero's Origin delivers a theme that exudes the feeling of freedom presented to players as they swing from rooftop to rooftop in the then-incredible playing area as a beginning Spider-Man.